“In his book one reads the mind of a man who not only loves the Moor, but never tires of exploring its beauties and mysteries. He takes us to the river sources, through their winding tracks, over the hill to the granite-topped tors, to the ancient monuments and circles. He reminds us of the elusiveness of Cranmere Pool – not so elusive in these days – and its remote situation in the heart of a morass at a high altitude. But he offers a rather more elusive spot to search out – Ducks’ Pool – not placed on the ordnance Map, although it is more distinctive in size and situation than Cranmere. Ducks Pool, therefore, is hardly known to more than a few ardent wanderers on the Moor, and should be introduced as the southern centre of attraction by means of a post box and stamp placed in a cubby hole in the southern embankment. His book tells the reader how to reach Ducks Pool just as it does all the other places of special interest. As a guide it should prove of great value. ‘The Romance of Dartmoor,’ by Jeffrey W. Malim (Jowitt & Son, Torquay, 6s).” – The Western Morning News, July 15th, 1935. It soon becomes obvious from the book’s dedication that Malim was well acquainted with Dartmoor as amongst his three “staunch comrades,” who explored the moor with him was ‘Mooroaman‘ alias Fredrick Symes. This would clearly suggest that long days were spent trekking the wilds of the Moor and looking at the numerous old photos in the book soon confirms this theory. 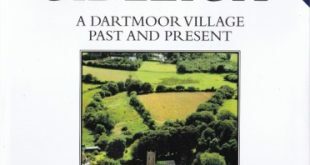 Dr. Jeffrey W. Malim lived in St. Marychurch at Torquay but when walking Dartmoor was more commonly known as ‘Moorover’. In his introduction Malim offers some insight as to how he became enthralled by Dartmoor’ “The first time I crossed Dartmoor was by motor car and I was not sorry to leave its desolation and dreary wastes behind; but some four years ago a friend introduced me to its fascinations and an abiding increased love for it came into being.” How true and I wonder how many other people could say the same thing, I know I can. He also gives some pointers of how at that time one should best begin their explorations; “It is better not to venture too far into the moor at first, until some familiarity with it has been gained, and no stranger should go without a strong walking stick, compass (luminous preferably) and an Ordnance map of 1 inch to 1 mile. Before going on a moorland expedition it is advisable, and a pleasurable thing, to read up the intended route, roughly mapping it out in a small note-book.” The book is dived up into nine main chapters which encompass; ‘General Impressions’, ‘Prehistoric Antiquities’, ‘Bridges’, ‘Crosses’, ‘Rivers and Brooks’, ‘Lakes, Pools and Ponds’, ‘Highways and Byways’, ‘the Forest and Woods’, and ‘Hills and Tors’. Within each chapter are suggested walks where the associated landscape features can be found along with explanations as to their existence. One that caught my eye and serves as a prime example of the book was; “The Pixey Lakes in Hound Tor Combe are situated in private property. They are charming little artificial pools made by damming the Becka Brook. The best place to see them is from above the steep hill-side by Grea Tor on Hay Tor down, and the best time is when mists are driving over the combe from the south-west, giving occasional glimpses of the fairy-like pools far below. The way to get to Grea Tor is by the old quarry track which leaves the main road north-east of Hay Tor Rocks, and pass in a northerly direction from the quarries, where there is a deep pool of water in which people bathe in summer. From the quarry it is a matter of continuing in the same north-westerly direction to reach the rocks above the combe.” I certainly had not heard of the place-name ‘Pixey Lakes’ before but although not named the modern OS maps do mark the spot as – ‘dams’. Secondly the route does show that he was not one for the ‘easy way’ because a much more gentler walk would be going there via Hound Tor. The book and Ducks’ Pool letterbox. One amusing event occurred in 1939 which demonstrates his liking for Duck’s Pool and his walks with ‘Mooroaman’ who noted that; “On our way to Duck’s Pool between Sheepstor and Eylesbarrow while awaiting “Moorover,” a lizard found its way onto a sleeve of my overcoat, which was somewhat of a camouflaging colour, and seemed content to remain basking there in the sunshine, moving if a shadow passed across it. One could see its pulsations. The creature seemed reluctant to be dismissed into the bank on which we had been seated, whence it had emerged. Its markings were beautiful.” Finally, there are two memorial plaques on the side of the caprocks on Rowden Tor on Rowden Ball. One is inscribed “Jeffrey Wentworth Malim -1877 -1958” and the other “In Memory of Mary Malim – 1876 – 1953‘. One might wonder why with all of Dartmoor to choose from Rowden Tor was the place of choice. Apparently the family occasionally used to stay in the locality which would answer the question. Sadly ‘The Romance of Dartmoor’ has been for ages out of print but occasionally you can track down a second-hand copy but be warned they don’t come cheap.